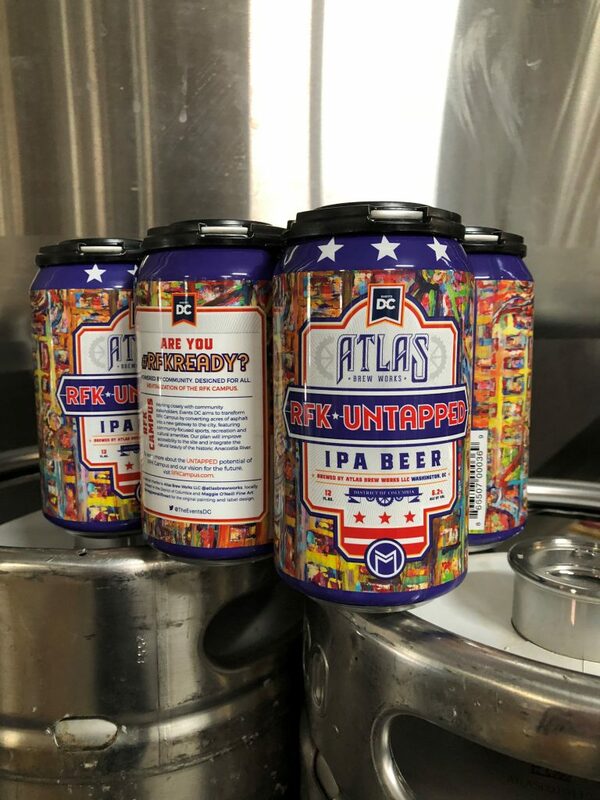 WASHINGTON — To celebrate and promote the revitalization project of the 190-acre RFK Campus, Events DC has partnered with Atlas Brew Works and local DC artist, Maggie O’Neill to release RFK Untapped, a limited-edition IPA beer. RFK Untapped will debut this week and be available at various events over the next several months while supplies last. Maggie O’Neill’s can art design embodies L’Enfant’s iconic street design – full of vibrant colors to showcase the limitless possibilities for the future of the RFK Campus. Working closely with community stakeholders, Events DC aims to transform the RFK Campus by converting acres of asphalt into a new gateway to the city, featuring community-focused sports, recreation, and cultural amenities. This holistic plan will improve the accessibility to the site and integrate the natural beauty of the historic Anacostia River. “I am honored to be collaborating and associated with the RFK Untapped campaign with Events DC and Atlas Brew Works. What better way to toast my hometown and all the colorful wonderful opportunity Washington, DC has to offer! Cheers to all past and future growth of this remarkable city, especially the RFK Campus redevelopment project,” said Maggie O’Neill, DC artist and co-founder of SWATCHROOM. “Atlas is super excited for this collaboration with Events DC and Maggie O’Neill Fine Art to bring awareness to the dramatic change coming to the RFK Campus. DC is changing rapidly and Atlas is proud to call the District our home and to produce our solar powered craft beer in such a dynamic city,” said Justin Cox, Founder & CEO Atlas Brew Works.